In last week’s Reasonable Expectations we looked at what medium-sized cities around the world were doing in terms of public transport investment and the benefits this brought to public space. Innsbruck showed the level of public transport aspiration that medium-sized cities should be aiming for. We’ve known for ever about European cities (large and small) and their great public transport. Kiwis with the privilege to visit them come home and sigh for a while about how great it was to be able to hop on public transport for most ordinary trips, without much thought and minimal hassle. Then we click back into “Kiwi mode” and keep telling each other “oh we’re not Europe” “we don’t have the population density” “oh we can’t afford that”. 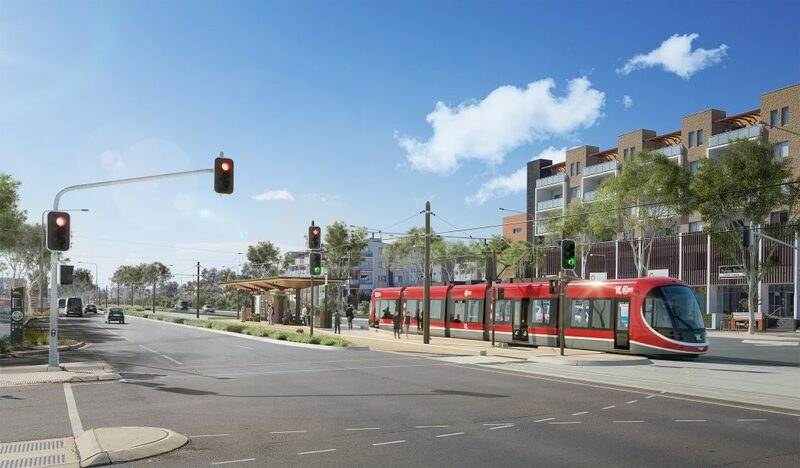 So let’s ask: is it realistic for Australasian cities to set their sights higher and embark on an urban transformation led by high-quality light rail services? Here’s an example: our capital city cousin across the ditch – Canberra – is doing just this. The similarities between Wellington and Canberra generally end at them both being capital cities of about the same population size. Wellington has long been known for being an exciting, vibrant, compact place that punches above its population weight in terms of its theatres, food and drink culture, and cosmopolitanism. Canberra is the quintessential planned capital. Everything is orderly, according to the planners’ specifications, with big wide spaces and grand vistas. This means large spaces between adjacent buildings and places of interest, and plenty of space for highways to fill the gaps. The end result? Cars also tended to dominate, thanks to the generously sized roads, and the relatively weak public transport services comprised mainly of pretty basic bus routes. Unsurprisingly annual public transport use in Canberra was around 19 million boardings a year (versus Wellington’s 38 million). 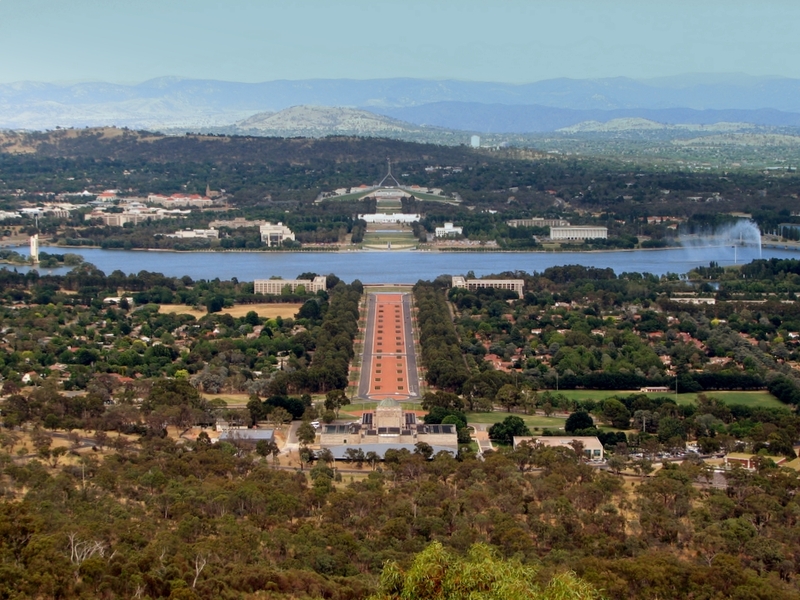 The Australian Parliament from Mount Ainslie. Big, grand… and a bit dull. You know you’re a bit embarrassing when your fervent supporters are writing articles like this, and Canberra has been undergoing a remarkable transformation over the last decade or two. Rapid urbanisation has seen many apartments being built in the inner city, as well as in the surrounding town centres. When you have more people living in the same space you need to get them around efficiently. So the city decided not just to fiddle with small changes to public transport (or trying to do major system improvements “cost neutral”) they made a bold statement about where they were heading. 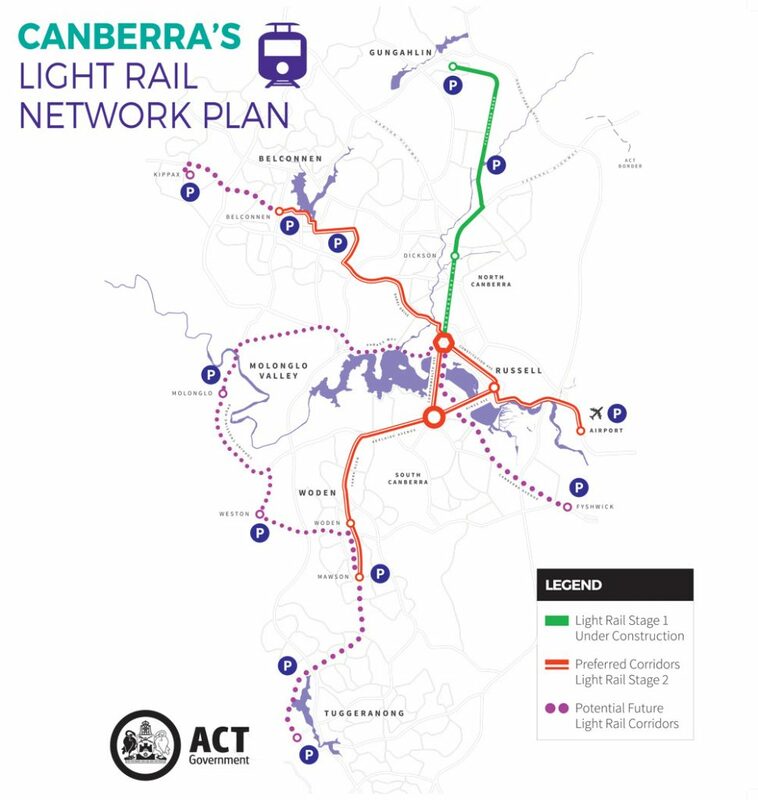 Canberra would build a full Light Rail network. The first line would link the City Centre to Gungahlin, a fast growing town centre to the north, along a rapidly expanding city corridor (green line in map below). Canberra’s status as a territory makes this plan somewhat easier. Canberra is effectively a city-state, without many layers of central, regional and local governments to negotiate with. But a vision was still required, and this came from the territory government. At the last election the Labour-Green coalition’s key pledge was to build the first stage of the Light Rail network. The first section will cost $710 million. 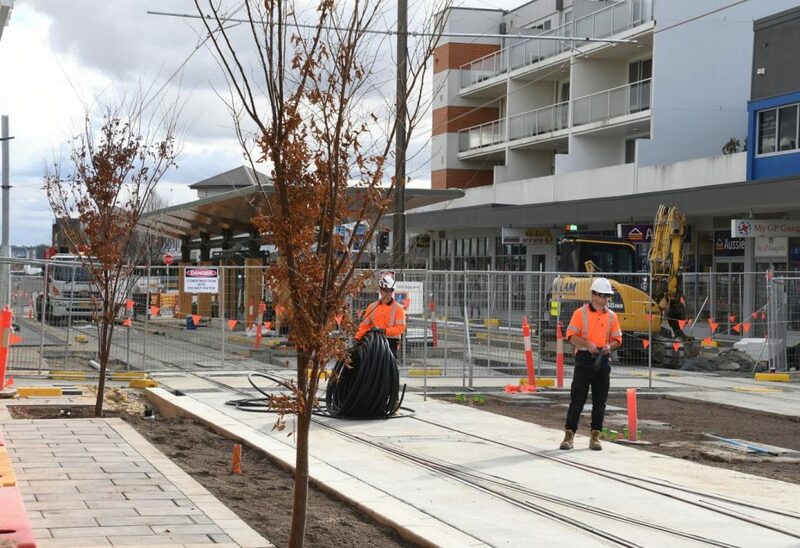 The project is being delivered as a PPP, so the ACT government will be paying $65 million per year for the next 20 years, which covers both the infrastructure and operating costs. Services are proposed to run every 6 minutes at peak times, and every 10 to 15 minutes outside of that. 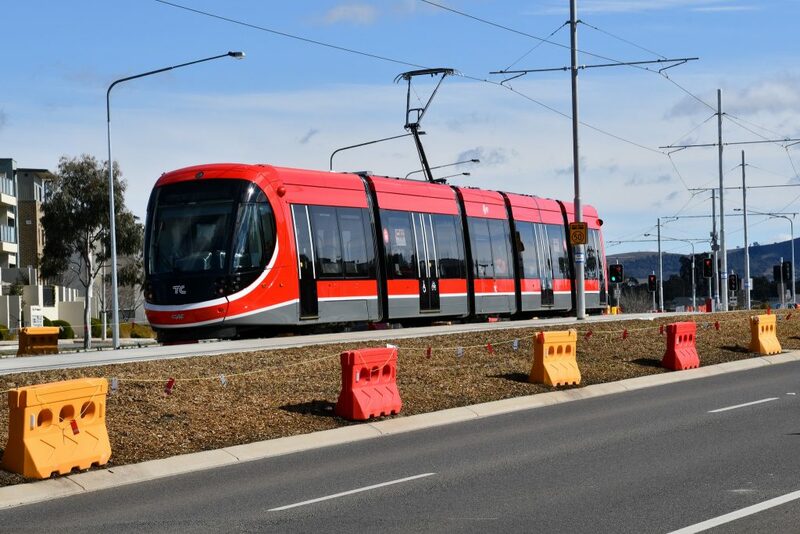 The vehicles can run at up to 70 kilometres per hour, and will deliver a 24 minute journey time for the 12 kilometre distance between the centre of Canberra and Gungahlin. Note for comparison the distance from Wellington railway station to Miramar is 8 kilometres, and 9 kilometres to Wellington Airport. Render of one of the stations. Shades of Courtenay Place, or Adelaide Road? So how is it all going? Well, Canberra’s Light Rail has been been under construction for the last couple of years. Things generally seem to be going very well. The network is due to open in early 2019, and the images so far should make anyone envious. They’re also using the opportunity to remake the streets. So the light rail can move efficiently, you make it so private motor vehicles are guests on the streets (and you don’t need most carparks there anyway because thousands of people are coming and going without cars). So Canberra is now getting the city magic formula: modern, high capacity light rail running along corridors with modern urban apartments being lived in by thousands of people, using the city as their playground and workspace and lounge and community. We’ll be sure to report back in a few months once Canberra’s light rail system is up and running. However, if our sprawling, “most boring” capital city cousins can do this, then why can’t we? Wellington Light rail a possibility? Not just Canberra but the Gold Coast, Cant help but think its just what Wellington needs. Couldn’t agree more. if we want to reduce the numbers of buses and traffic, then a service that runs down the main routes every few minutes is the way to go. Just look at what similar size locations are doing. While we debate, more debate, and debate. Look how long its taken to build Aucklands city loop. I lived in Auckland in the 60’s and 70’s and they were talking about it. Now its happening! !